The best workout is one that feels successful. The welcoming design of the Freemotion r8.3 Recumbent.. If you're looking for a straightforward upright that works for people of all fitness levels, check o..
Freemotion has captured all the excitement and expertise associated with Tour de France official rac.. The s11.6 Indoor Cycle was created with the highest biomechanics and engineering to create a “real r.. Welcome to the ultimate cycling experience. With sophisticated features designed for your mem.. 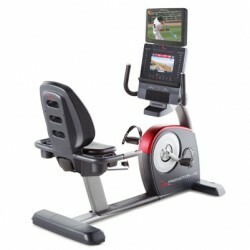 The low profile, STEP THRU™ design creates a new workout opportunity for people who want to build lo..
With a bigger seat and wide, cushioned elbow rests, the Freemotion u10.2 Upright Bike is technology-..